Vindicia>Blog>Can subscriptions save a dying retail chain? Can subscriptions save a dying retail chain? A number of businesses announced or launched new subscription services this year. For example, Microsoft released a Netflix-style subscription called Xbox Game Pass, allowing users to rent Xbox One and Xbox 360 games on their consoles. Ford expanded its monthly car subscription service into Los Angeles, while Cadillac did the same for both LA and Dallas. Recently, Office Depot began a service for startups called BizBox, which provides a collection of services such as accounting, payroll, online marketing and more. 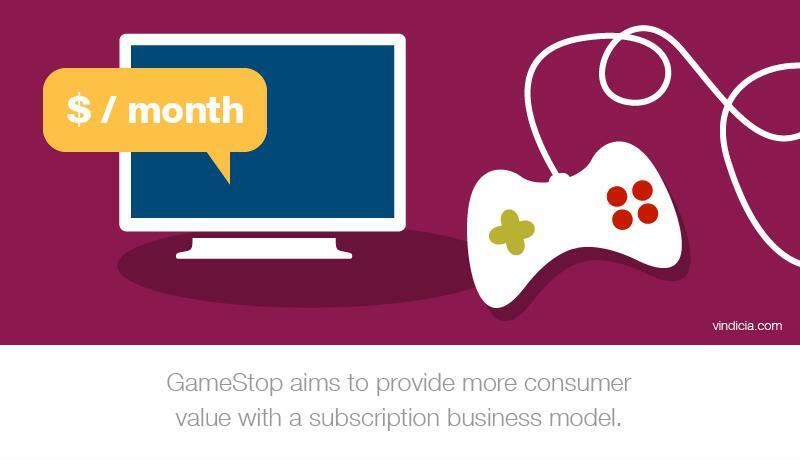 Clearly, many businesses realize subscriptions are the monetization strategy of the future. One of the most interesting subscription announcements came from GameStop. Because of its declining relevance and market share over the past decade—not to mention its digital competition—he video game retailer has often been compared to Blockbuster. In fact, according to CNN Money, the company's stock fell more than 31 percent in 2016, and it announced in March of this year that it plans to close 2 to 3 percent of its physical stores. A new subscription service called Power Pass may change all that. As Tech Crunch reported, GameStop's new subscription service lets customers rent video games from the company's retail locations. The product costs $60 per six-month period, and users must sign up for GameStop's Power-Up Rewards program to use it. Any Power-Up Rewards tier grants access to Power Pass, including the free one. The cost seems steep at first; however, when one breaks the math down to $10 per month for six months, it's actually cheaper than the average Netflix plan. What's more, Power Pass offers customers a similar value. Subscribers can rent an unlimited number of pre-owned video games during the six-month period. While they can only hold a single game at a time, they can keep one title of their choosing at the end of the six-month period. Considering the average price of video games ranges from $40 to $60, Power Pass gives customers a lot more value than an outright purchase. The subscription service offers gamers more value. The subscription service launches Nov. 19, just in time for Black Friday and the holiday rush. This timing could allow the company to capitalize on holiday purchases by friends and families of gamers who are confused by the large number of product options. A subscription rental service is a much easier gift to purchase than a specific title. Assuming, for example, a Power Pass subscriber rents one game per week, that person gets to access approximately 24 titles, one of which he or she gets to keep, within the span of half a year. According to Fortune, GameStop's video game retail shares fell 3.4 percent at the end of Q2 2017. Historically, the company has tried to offset a history of falling game sales by promoting tech gadgets and pop culture gift items, but these efforts haven't made up for GameStop's overall decline. However, the Power Pass subscription may be the saving grace the company needs. Although GameStop subscribers wouldn't get the convenience of renting games from home, the overall value they get from Power Pass is more than worth the drive to a retail location. Assuming GameStop effectively convinces customers of this value, Power Pass may be able to keep the company afloat by promoting store traffic, which can encourage more retail sales. This particular effort to add a subscription business element to a traditional brick-and-mortar legacy effort looks promising, and it's one of many similar ventures. As customers seek increased value and convenience, the subscription business model may provide a better alternative than the traditional retail landscape. Streaming music subscriptions are up - how should companies react in 2018?